Current state: Release Candidate Danger, Will Robinson! Danger! Done: Port 550D button hack to 1100D AE_COMP to open menu but retain the original long-press functionality. The current version compiles and runs on 1100D. 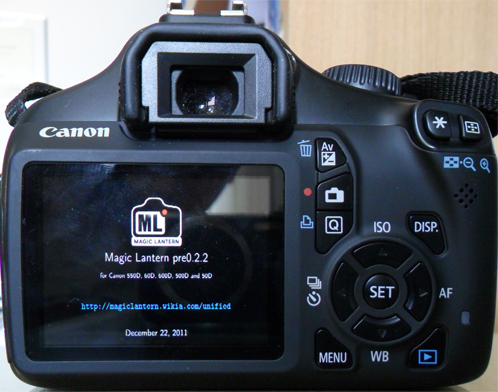 RC 3: http://nanomad.magiclantern.fm/1100D/magiclantern-v2.3.1100D.RC3.zip Use development builds instead!! Use the included .fir (for 1100D 1.0.5) to enable the bootflag. Tip: for AV button, you may want to look at 550D implementation, where it's used for arrow key shortcuts (tweaks.c). This button has different codes, depending on the shooting mode. I've only considered P, Tv, Av, M and Movie. Those are state objects ( http://magiclantern.wikia.com/wiki/StateObjects , http://a1ex.bitbucket.io/ML/states/ ) - some sort of event-driven tasks which are pretty easy to hijack (that is, execute ML code at certain moments, like once per LiveView frame). Most of those things contain strings with their name (for our example, we have EvfState and Evf\\EvfState.c). So, at 0x4C34, Canon firmware saves a pointer to EvfState object (see "struct state_object" in state-object.h). For the fonts: on 5Dc we have used a trick to downscale the bitmap coordinates on the fly (its resolution is 720x240). On 1100D, the screen resolution is 360x240 if I remember well, but the buffer size is 720x480, and the firmware does some sort of interpolation (is it nearest neighbor or something else?). The medium font has a width of 12 pixels, and the bottom help text in ML assumes this width (max 60 chars). Probably a very tiny font rendered at width=6px and with pixels doubled could work a bit better than current medium font. If not, can we consider a larger font (maybe the current small font with doubled pixels, that is, width=16px), and use horizontal scrolling of help text, like in rockbox? I'll have a look into fonts after making the ML menu button work reliably (shouldn't take too long). Also: how much free memory do you have on 1100D? The 60D, 550D and 600D had some problems with this (but now there are solutions, only that I need to know which one to apply). Hm... not much. Can you try compiling without -mlong-calls with a 32-bit gcc? I'll fix this (need to do the same on 600D), but it may take a while. The overlay means clock and other small extra info from outside LiveView? It's ifdef'ed out (debug.c, around line 1800). Remove -mlong-calls from Makefile.inc . Applied memory fixes to 1100D (though you may need to double-check the addresses). Well, it sure did something. Not bad. And if the screenshot feature works, it's probably enough. If not, we may have to move something from the big buffer to the small one. The 60D gives random ERR70 if the second buffer has less than 1MB free. Probably I should also display the maximum contiguous block. Exp Comp - you mean expo override? So, the 1100D now has manual video controls, right? The 600D has problems with ExpSim too, so it should be commented out in the 1100D too. I'm want to help with the development for T3/1100D, I have a lot of experience with C/C++, but I don't have experience with reverse engineering, is it enough to help? Also, I have experience with graphic design, so maybe I can help develop a special font that will look better on 1100D low resolution screen. There is anyway to render ML menus in 720x240 natively, then upscale it using nearest neighbor to 720x480? I think that's how it is done on the official firmware. What would be required to change in ML in order to do this? or is it not possible due to it requiring to rewrite core parts of ML? By the way, is 1080p video option really completely locked down on this one? Or did you guys found out anything? I remember seeng something about this on ML Google Groups last year. I'm glad you want to help. I suggest you start by setting up the toolchain to compile Magic Lantern and compile the latest release for the 1100D. The 5Dc renders ML menus at 720x240, so you can inspire from there. All the changes required for this can be in bmp.c / bmp.h / vram.c IMO. Then I'll look into 5Dc source. I've seen some 5Dc constants in bmp.c and vram.c (CONFIG_5DC), won't some of them work on 1100D? It seems that Canon is using some tricks to get most of 1100D display, can someone send me some screenshots of the original firmware menus? I want to take a look how Canon is doing it. By the way, there is any specific reason ML font is looks like a system font? I'm thinking about creating a more rounded font, similar to the one in the official firmware, I can do it from the scratch, pixel by pixel (I have some experience with pixel art for games and stuff). This is specially useful for extremely small text, so I can tailor it to look good in low resolution. Hi, I'm glad you want to help. Leave me your skype/gmail address in PM and I'll get you started on the 1100D port and ML in general.